An online Art Gallery for Philippine Contemporary Art and the Filipino Artists. Through Its spaces, exhibition & galleries, aims to promote the Philippine Contemporary Art by showcasing the art works of notable and emerging Filipino Artist. Gallery of art works from notable and emerging Filipino Visual Artists from the Philippines. All art works displayed are part of our personal art collection. Learn more about the Visual Artists, their background, their achievements, exhibitions, in the Philippines & around the world. How Macuha Art Gallery started, our advocacy & the people behind Macuha Art Gallery. 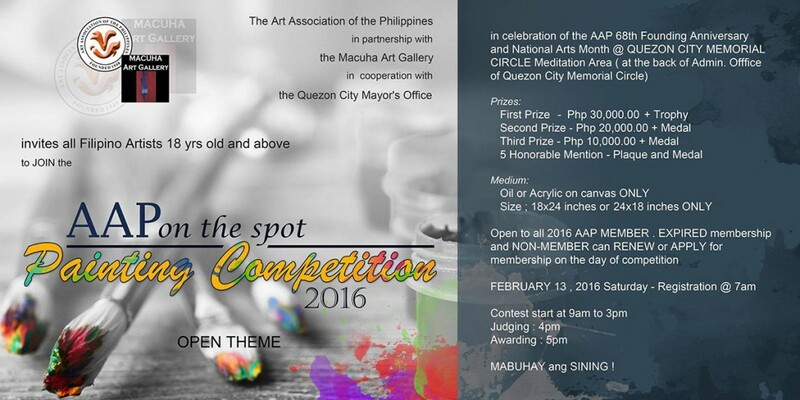 AAP – Art Association of the Philippines, in partnership with Macuha Art Gallery and in cooperation with the Quezon City Mayor’s Office, invites all Filipino Artists 18 years old and above to join the On-the-Spot Painting Competition 2016. The AAP On-the-Spot Painting competition 2016 is in line with the celebration of the AAP’s 68th Founding Anniversary and the National Arts Month. The venue of the Competition is at Quezon City Memorial Circle Meditation Area (at the back of the Administration Office of Quezon City Memorial Circle). The On-the-Spot Competition will be held on Saturday, February 13, 2016. Registration starts at 7:00am. The contest proper starts at 9:00am and would end at about 3:00pm. The judging of entries at 4:00pm, while the Awarding Ceremonies is schedule at 5:00 pm. The On-the-Spot Painting Competition is open to all AAP Members. Expired members could renew their membership on the day of the painting competition. Non-members can apply for AAP membership on the day of the competition. The acceptable medium is Oil on Canvass or Acrylic on Canvas only. The allowable size is 18 inches x 24 inches or 24 inches x 18 inches only. AAP On-the-Spot painting Competition is Open Themed. Trophies and Cash Prizes awaits the First, Second and Third Prizes. Five Honorable Mentions will be chosen and will receive Plaque and Medals. The Art Association of the Philippines is an art organization that aims to advance and foster, and promote the interests of those who work in the visual arts. It stakes its position as a circulator of artistic goods within a general system of production, circulation and consumption. Macuha Art Gallery supports the Philippine contemporary arts and the Filipino Artist. Through its spaces, exhibitions and gallery, aims to promote the Philippine contemporary arts by showcasing the art works of notable and emerging Filipino Artists. what are requirements for membership?